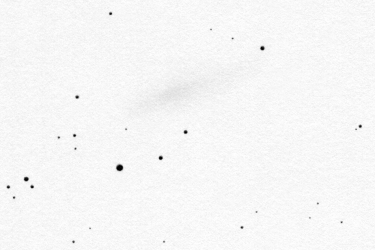 Long ago when I was browsing through the map of Coma Berenices I spotted these two globular clusters next to each other. Not much after this when I aimed my little 4.3" Newtonian telescope at the clusters I was surprised that NGC 5053 was not visible at all next to the bright M 53 (Messier 53). Since then I wanted to draw this very unequal pair. 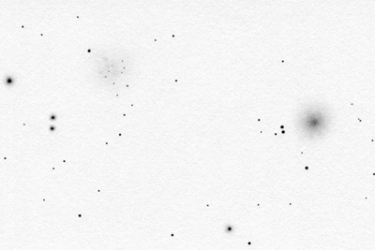 The two clusters are quite far, about 1° apart therefore they would look nice in a rather large field of view. On the other hand I wanted to use bigger enlargements to possibly bring out some details. So I decided to make a panorama drawing. But this time I didn't use predrawn stars at all. 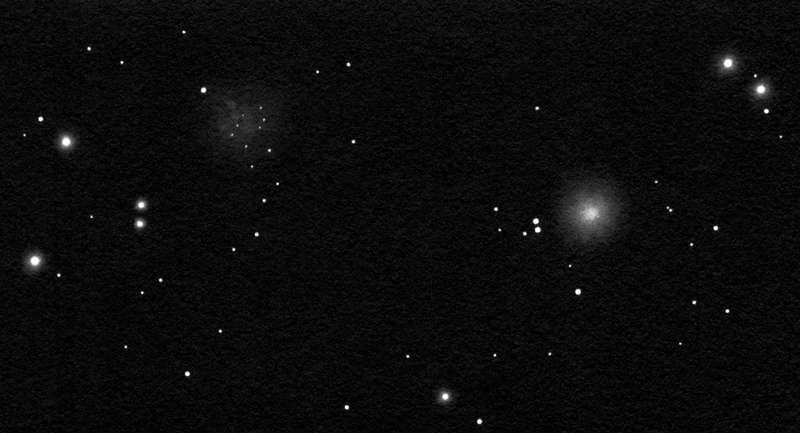 I drew the brightest stars with my 4" telescope using the smallest, 16x enlargement (3° field of view). Then I drew everything I could see using the same telescope and 40-50x enlargements. M 53 - NGC 5053 drawing inverted into positive. M 53 is 7.7m based on catalog data. In the telescope it is very bright and it is getting very suddenly brighter towards the center. But the core region is extended, it is not star-like. The globular cluster is symmetrical. It doesn't show any sign of resolution apart from a couple of low-contrast spots on its surface. I feel that it might be very dense with a lot of equally bright (faint) stars. But the little telescope doesn't show anything from this. Contrary to this NGC 5053 is barely visible. It is supposed to be around 9.0m based on the catalog. 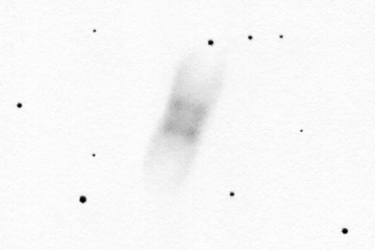 It is very faint, diffuse and shows almost no concentration towards the center. 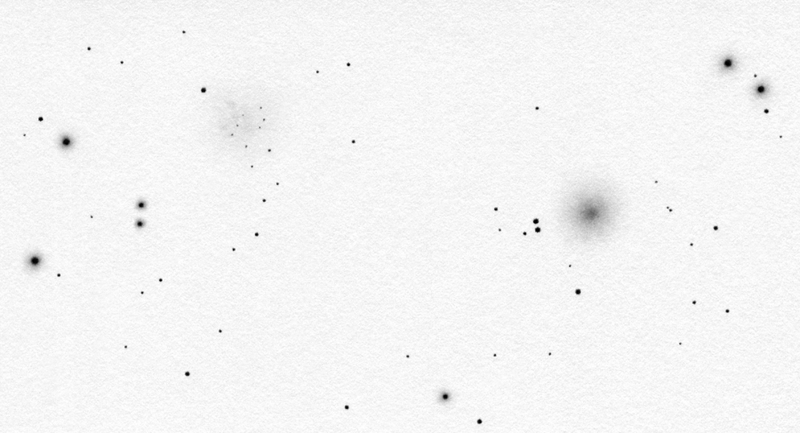 A couple of faint spots can be drawn by position and a few very faint stars twinkle on its surface. The two globular clusters are not only seemingly close to each other. They are also in physical contact. Both lie at a distance of 55-60000 light years from us and from tha galactic center as well. 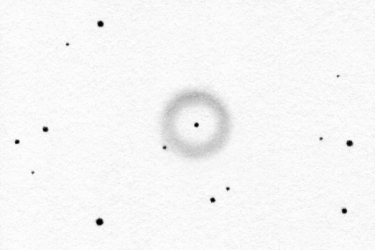 That is they are relatively distant globulars. Hence the lack of resolution and the faintness of the cluster members. There is a weak tidal tail between the two clusters that can be brought to light by analysing the SDSS data (using star counting methods). This indicates a former interaction between the clusters. Both globulars contain metal-poor stars. That is the cluster members contain a relatively large fraction of hydrogen and helium. This indicates old, first-generation stars. So both clusters are very old. It is possible that both globulars come from outside our Milky Way. Our Galaxy could have stripped them off of a smaller galaxy in a collision long ago (?). The Sagittarius Dwarf Spheroidal Galaxy (Sag dSph) is a candidate for this smaller galaxy in the case of NGC 5053. This is my first deep-sky drawing where I tried to draw the bright stars with a little less contrast in order to possibly get closer to the live view. I took this idea from foreign (mainly German and American) amateurs (see deepskyforum.com). Of course the drawing does still not precisely reflect what can be seen in the eyepiece. The stars are all tiny dots of equal size in the telescope regardless of their brightness. There were no diffracion spikes around the stars beacause of the construction of my telescope - it has only one bent secondary mirror holder. 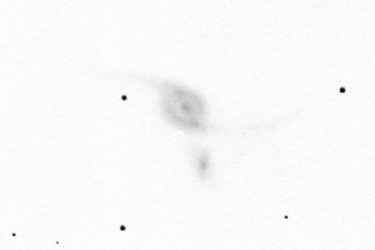 You can see the SDSS (Sloan Digital Sky Survey) image above taken with the 2.5m telescope next to my inverted drawing. I rotated and cropped the photo so that both images cover about the same area of the sky. 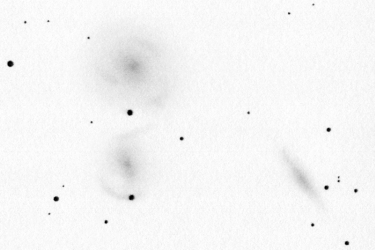 The SDSS image shows a few artifacts that were caused by either optical effects or by image processing. 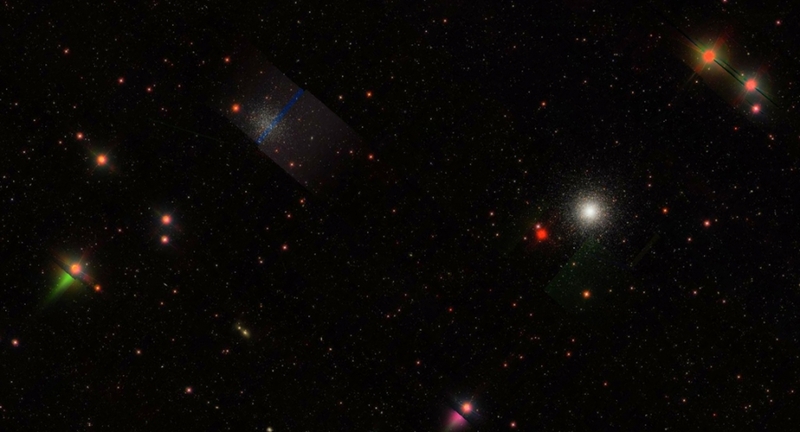 I am thinking about the green/orange glint next to the bright stars and the blue line crossing NGC 5053.